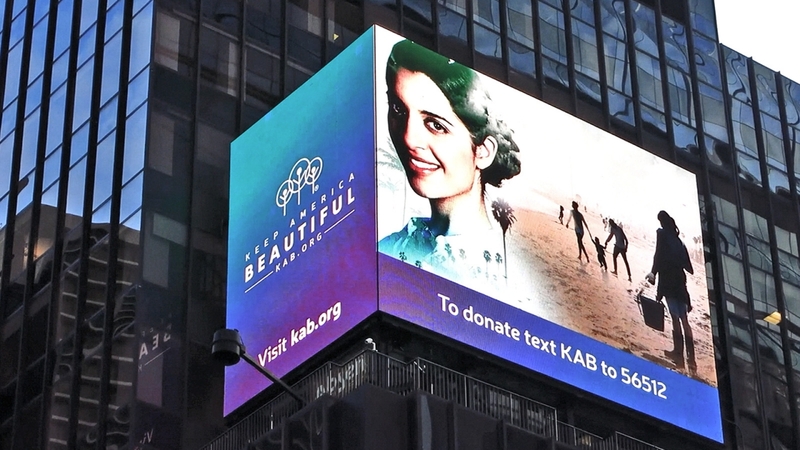 Keep America Beautiful celebrates its 65th anniversary by lighting up Broadway with an electronic billboard in New York City's Times Square. STAMFORD, Conn., December 6, 2018 /3BL Media/ -- Keep America Beautiful, the iconic national nonprofit community improvement organization, is lighting up Broadway this holiday season in celebration of its 65th anniversary. More than 1 million people pass through Times Square every day during the holidays and it’s a perfect time for Keep America Beautiful to share its vision of a clean, green and more beautiful America with millions of tourists and New York City residents alike. The promotion will run on the digital billboard at The Bowtie (1500 Broadway and West 43rd Street), at least three times per hour in 15-second segments. This is a great opportunity to share the Keep America Beautiful message with the world, and an occasion to donate to Keep America Beautiful by texting KAB to 56512. The Times Square advertisement complements Keep America Beautiful’s 65th anniversary PSA – “Let’s Talk About America” – which has been seen in 181 media markets across the country with more than 30,000 airings in 2018.